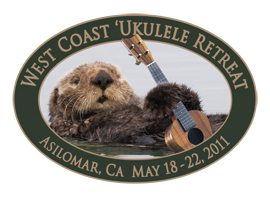 The West Coast Ukulele Retreat begins today at the Asilomar Resort on the Monterery peninsula. Students attending the retreat will be treated to 86 hours of ukulele heaven taking informative workshops by James Hill, Del Rey, Gerald Ross, Brook Adams, Andy Andrews, Dave Egan, Mike DeSilva and yours truly. The retreat is the brainchild of Elaine de Man, who also produces the wonderful Wine Country Ukulele Festival each September in St. Helena, California. Look for a complete report (with video) next week.